From everyone on the Clovest team, we want to give a hearty thanks for all your support to DC Patisserie's campaign! We recently spoke with DC Patisserie about their campaign and learned that they found a way to finance the machine without spending the entire $25,000 up front! For that reason, we reduced their fundraising goal to $10,000 to ensure that they can utilize your support and get the capital improvements they need to grow their business. 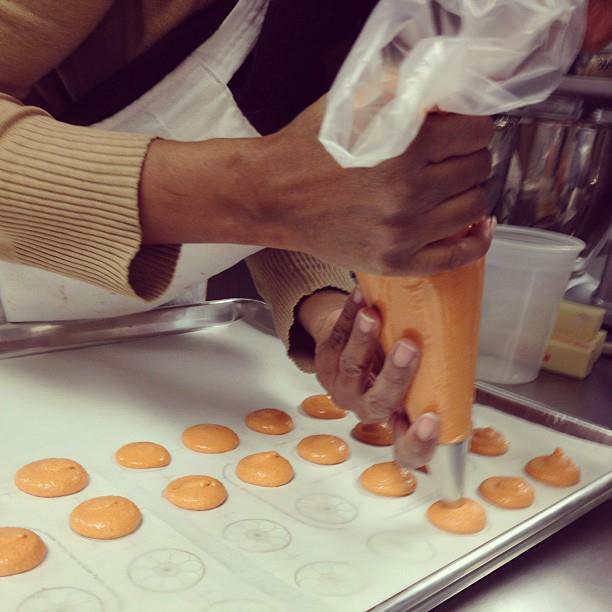 We're looking forward to seeing Alex in action at the macaron-making party and we hope you are, too. The fundraising campaign is open until midnight tonight so be sure to spread the word or make a loan if you haven't yet– they're still trying to reach their stretch goal of $20k! If you'd like to modify your current loan, please do so before the project ends or simply send us an email to do so before December 27th. Thanks again for all your support and here's to local business growth! 4 DAYS LEFT + Interview with Clovest! Thanks to our 38 supporters so far! We're have under two-thirds left to reach our fundraising goal and purchase the Great Macaron Depositor! Clovest recently interviewed me to learn more about how I got started with DC Patisserie and about my experiences as an entrepreneur. Check it out below, share it with your friends, and help us get that last push we need to reach our fundraising goal. We're thrilled for all the support you've given thus far, so lets make the next 4 days count! Alex (center) with the staff behind the Cooking Channel's Unique Sweets, which recently featured DC Patisserie! Clovest: What were you doing before you decided to start DC Patisserie and what inspired you to start the company? Alexandrine: I was a lobbyist for the Recording Industry Association of America for about three years. I started taking some cooking baking classes during that time and that’s when I started making macarons and taking them to work, taking them to different parties, that sort of thing. People liked them but I was definitely working on the recipe. To be honest, one of the things that excited me about macarons was the fact that they were supposed to be really hard to make. Like there was something so inconceivably difficult about getting them just right. A lot of people try to make them and get discouraged, and a lot of people can make them on their first try but have trouble with consistency. I was not one of those people that got it on the first try. I had plenty of trouble, especially getting them to be consistent every time. But, as with most things, you keep trying at something long enough and you begin to get the hang of it. So I think about into my last year, I heard some rumblings of how they were going to let people go and I thought to myself, hey, maybe this is the time for me to actually to start this business I’ve been thinking about for the past couple years. I had just recently gotten married and my husband has been incredibly supportive through this whole thing and that’s really meant everything to me. 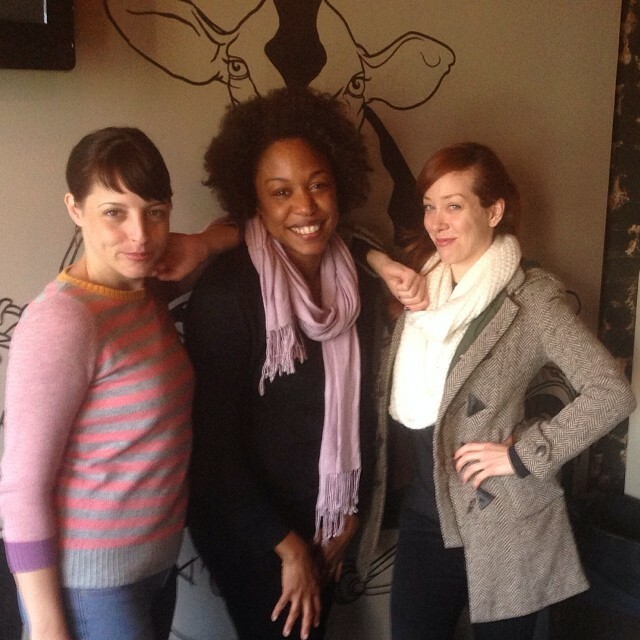 Clovest: There are a lot of DC chefs finding their start at Union Kitchen. What’s your experience there been like? ADB: I don’t know if you know Maya Robinson from the DC Grey Market, which was an event for food entrepreneurs who didn’t have the registration or business licenses to sell their food in stores but who wanted to give their stuff a try. I went to a bunch of the Grey Markets when they were running and although they closed after a while, Maya told me I should get in touch with the guys at Union Kitchen. So I went down there to check it out, and being one of the first people to sign up, there was practically nothing there. It’s a lot different now. I told them I’d sign up for six months and if I wasn’t selling anything, I’d leave. I’m doing o.k. now, so I’m still here. I’ve had a great experience working here and the people I see on a day to day basis are great to work with. As this company gets a bit bigger, though, I think I will probably look for a bigger space. I mean, this depositor is gonna take up a bit of room. 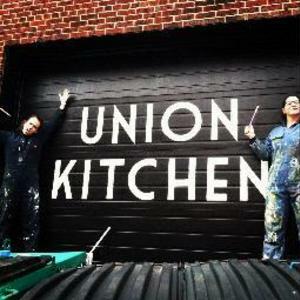 And I think that’s really what Union Kitchen is all about, giving entrepreneurs a launch pad to try out their stuff. Clovest: Some of us have never even had a macaron, can you tell us a bit more about what goes into them and how they’re made? So you have your egg whites and you have your sugar, and usually while you’re beating the egg whites you’ve got your sugar boiling at 118 degrees—118 degrees is sort of a magic number—and when you hit it, you add that sugar mixture to your egg whites, which starts to cook them. After things cool off a bit, you stop the mixer and the egg whites are usually a glossy meringue at this point. The meringue is added to your almond flour mix and gets folded together. This is really the part that takes practice. If it’s mixed too much the batter will flow too quickly and when you go to pipe it, it will run all over the place. If you under mix, the batter will be too thick and when you pipe the cookies the batter will be stiff and puffy. When everything’s just right it will pipe slowly, and when baked it will create a foot—that’s the ruffle that makes it a macaron—without air pockets. Once you’re done with that you take two cookies and you sandwich ‘em together with whatever filling you like. Alex, at her craft. 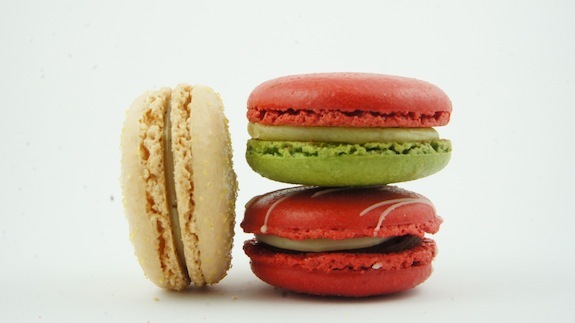 DC Patisserie will increase their production ten-fold with the new macaron depositor. Clovest: What’s your favorite flavor? ADB: Peanut butter and jelly. Without a doubt. Clovest: So how did you hear about this Great Macaron Depositor? I think I first saw it on YouTube after I had been looking at some of the French houses. Yes, the French have macaron houses that do absolutely nothing besides make macarons, if for no other reason than just to be elitist about it. It’s kind of like the fashion designers out there. I went to the New York location for one of these houses, I think it was Lourdray, and waited in line for like 30 minutes for one of their macarons. Maybe it was just the batch that came out that day, but I wasn’t that impressed. It was O.K. I think at a certain point I’ve become biased. Clovest: A lot of people have started their own businesses in the last couple years. Could you speak a little bit about what it’s like running your own company? I know it sounds kind of dry, but you’ve got to know financial management. I was talking to a friend who is a barre teacher; she loves it and she’s toyed around with the idea of starting her own business. I asked her one day: "Have you ever looked into making a business plan or plotting out how you’re going to make money doing this?" She said "Oh, I guess you’re right." and for me it wasn’t so much about being right, it was just that I want her to succeed. I think these are the kind of things that entrepreneurs tend to neglect when they’re coming up with this great idea. The financial side of things is really important because it basically amounts to how long you can do this thing that you love so much. I don’t think that many entrepreneurs realize that they will actually have to deal with spreadsheets or make a profit and loss statement. I mean, if you can pay for someone else to do it, that’s great, but most people starting a small business don’t have that kind of money to spend. So I’ve been to some classes on writing a business plan and that sort of thing. The Women’s Business Center in D.C. runs some great programs for people thinking about starting up a business of their own. Clovest: Why did you decide to crowd fund this project and what made you choose Clovest? I’ve run this company for about fifteen months now, I’ve put in a decent amount of my own money into it and I realized that at a certain point, I can’t do this alone. If my company is going to take on some of the capital expenditures that it needs to grow into the next stage, I’ve got to get other people on board. So I looked at Kickstarter as well as Clovest, and I didn’t really have the time to worry about managing the rewards process. The prospect of hosting a macaron party for every person that donated $500 was pretty daunting. Clovest just made a lot more sense to me. And there’s also the whole local and interpersonal element that I really like. 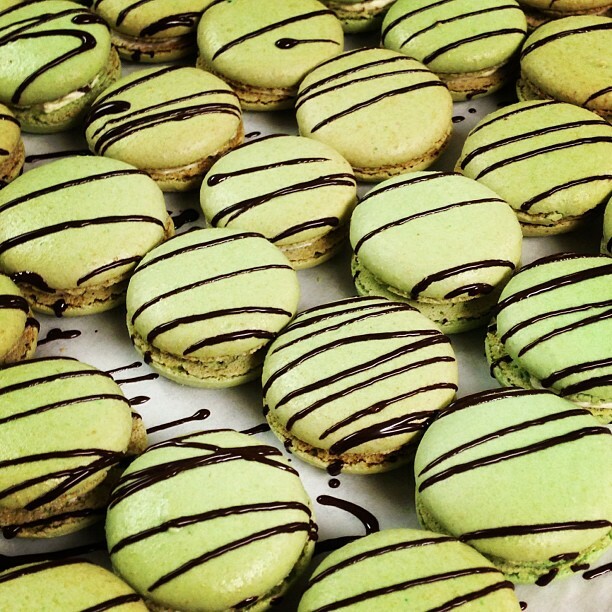 Mint chocolate chip macarons– do these not look delicious? Support the campaign and bring your friends to the macaron making party! Clovest: I remember you’ve said that you tend to have a bit of stage fright. Are you excited for your macaron crafting marathon? It’s not stage fright. I just tend to be more comfortable around smaller groups of people. I haven’t thought about the party that much yet. I think we’re just going to have a good time and learn how to make macarons. I think it’s going to be a lot of fun. There’s something about sharing something you love with other people that really gets me going, which is I guess why I started doing this full time. You really start to get into something and it gives you a certain kind of pleasure. Then you start sharing it with other people and that’s kind of a whole other thing. We're excited to be a part of CityEats.com (created in partnership with the Food Network) The Ten: Holiday Cookie Hot Spots! This year we're featuring three new holiday flavors: egg nog, peppermint bark, and pistachio cherry. You can read more about us and other great holiday cookie spots here. Campaign extension for the holidays! From all of us at Clovest, we want to wish you a very joyous and happy Thanksgiving! Thanks for all your support and interest in DC Patisserie and their fundraising campaign to extend the reach of their amazing Macarons. If you haven't had a chance to try them yet, give them a taste by ordering online– they also make great gifts for the holidays! In line with the giving spirit and recognition of all the great support you've given them so far, we're extending their Clovest campaign until Friday December 20th. We encourage you to make your loans if you haven't done so already and enlist your friends to help make it happen. Remember, you'll be paid back your contributions over the next three years AND get an invite to their one-year anniversary party with tastings of their latest creations and some experimental flavors! So join DC Patisserie's campaign, spread the word, and order a batch. But most of all, enjoy your holidays with family, friends, and loved ones. We're at the Warming Station! We're so excited to be a part of The Warming Station, an exclusive pop-up kiosk that will serve the thousands of hungry tourists visiting the East Pier of the National Harbor for the holidays. An average of 5,000 daily visitors (12,000 on special events) will come to this celebrated DC destination to visit ICE at the Gaylord Hotel, the Ice Skating Rink, fire pit, and carousel. Other attractions include the 20-foot Christmas Tree, fireworks, carolers, and harbor light show. The pop-up will feature some of the best artisan food vendors in the area including Whisked, Thunder Pig Confections, Banana Love Muffins, and DC Patisserie. Starting November 23rd, they'll be featuring some of our newest flavors in time for the holidays including S'mores, Pumpkin, Egg Nog, and Peppermint Bark macarons. Hope to see you there! Before we gear up for the holidays, we thought we would offer two flavors that we've been working on for a little while, PB&J and Lemon-Ginger. Our PB&J is our take on an American classic. 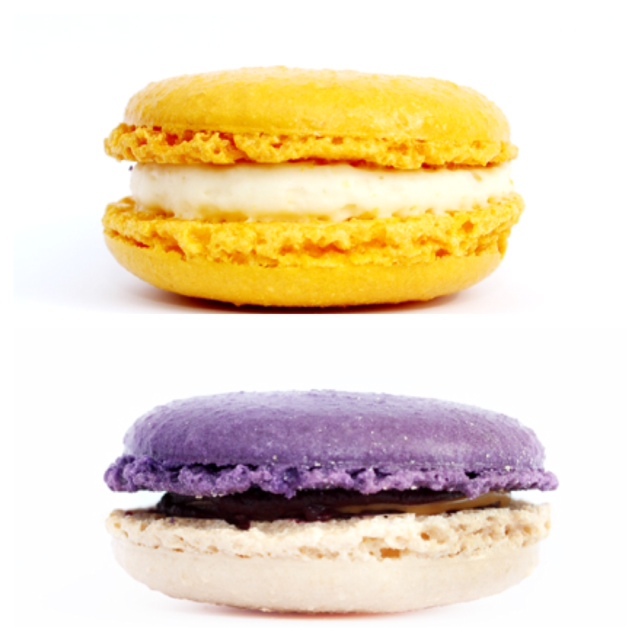 Instead of grape jelly, we sandwich blackcurrant ganache and creamy peanut butter in between 2 almond meringue cookies. The taste always brings us back to our childhood. The second is a Lemon-Ginger macaron. It's made with fresh lemons and crystallized ginger. If you're a fan of lemon desserts, you're sure to love this one. You can get both flavors now on our site at www.dcpatisserie.com.